This article is version 0.25. Version 0.25 We will list the revised history and the added features at the end of this document, Because it is too much. 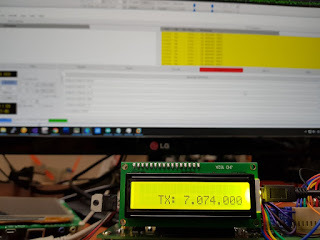 Important memo : The 0.224 version supported most of the software and operating systems, but the 0.25 beta version of hamlib, especially raspberry pi, such as Linux can not connect to the problem was obtained from the beta tester. It has been modified now and will be applied in version 0.26. Thank you all for the beta test. You can restore it to the original firmware whenever you do not like my new firmware. If you have uBITX and usb cable, everything is ready. No devices or parts are required for CAT communication. When the beta test period is over, I will reload it with the stabilized version. -In Ham radio deluxe, you can set basic settings such as CW speed side tone as well as frequency and mode change. 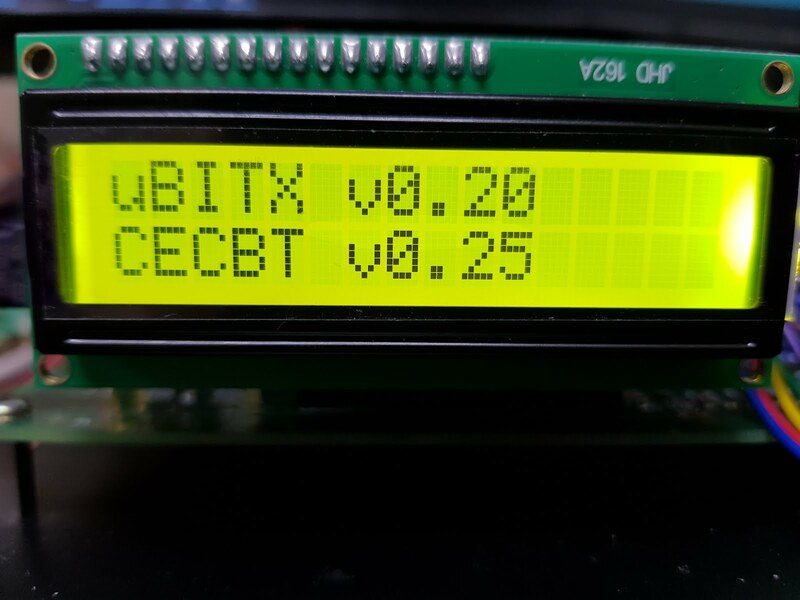 You can conveniently set uBITX values using Ham radio deluxe. If you use wsjtx, fldigi, jt65-hf etc., you can control the PTT control as well as the frequency by setting FT-817 as shown below. In digital communications such as the FT-8 and JT65, if only USB is connected to the computer, software such as wsjtx will control the uBITX's frequency and PTT. I also experimented with control on Windows, linux, and Raspberry pi. Memory Keyer function is also built in. I will post about the memory keyer implementation separately. I have created dedicated software that supports this firmware 100%. With this software, you can backup and restore various setting values of uBITX and manage the CW Text of the built-in memory keyer. In addition, you have built-in tips to launch your Callsign at boot time. Most of the bugs I found were fixed. For more details and videos, please see below. 1.A major change - Please refer to the bottom section for details. - I implemented the CAT protocol compatible with the FT-817 protocol. In other words, most software is compatible. Below are the test videos for compatibility with popular software. - Added uBITX dedicated protocol to CAT communication. You can back up or restore the settings of uBITX through external software. - Improved process for CW Key input. - So you can enjoy this with just a firmware upgrade without any modifications. See the link below for firmware upgrade instructions. I prepared for today. If the firmware has been upgraded normally, the following screen will appear for rebooting for 0.5 seconds. Thank you for your beta test. Again, you can always restore to the original version. do not worry. Most of the results of the first beta test have already been applied. If possible, I would like to take a stress (or called load test) test. For example, during CW Keying, the frequency shift to Ham radio deluxe. Testing with WSJT-X is the longest protocol, not short FT8. Please note that there is a problem with Arduino, and be aware of it in advance. I am trying to transfer FT8 from wsjt-x in about 3 hours prior to firmware distribution. 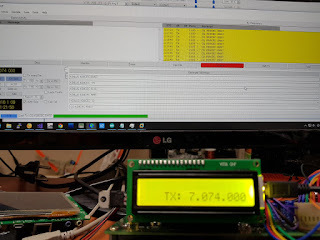 Of course, testing it by connecting it to the dummy load to protect the transceiver. I will post usage of the new firmware later. The order of posting on the blog is as follows. Most people will be able to use it without any explanation. They can use it right away. Or watch the videos I uploaded to see how to set it up. It is also good to use common functions and try it together when I post it. I will post one or more each day. - How to set and use Ham radio deluxe, wsjt-x, JT65 etc. uBITX manager is required to use the built-in memory keyer. I was trying to stabilize and distribute after the first beta test. Applying the feedback from the first beta testers, But I also added features such as memory keyer. If stabilization is needed, maybe i will remove one or more of the many features of the memory keyer. The firmware was based on Fashar's uBITX 0.2. It's changed so much now. 1.Most of the bugs I found were fixed. Compatible with FT-817 and FT-857. 3.CAT communication is not broken in CW or TX mode. If communication is interrupted by strong radio waves, it will probably be recovered within 10 seconds. 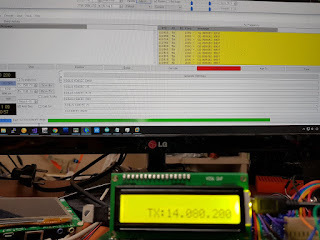 include auto recovery - I have been programming with the FT-817 about 15 years ago, but I have experienced some broken protocol on TX occasionally. So I put this feature in. All of these can be controlled by Hamradio deluxe. Since it is fixed at 600ms now, there is a problem when communicating over 15wpm. You can change it with the radio dial, or change it via Hamradio deluxe. Press the function key for more than 3 seconds to lock or unlock. 8.The first time you press the CW key, it reduces the time to TX. However, we have added a function that can delay the transmission time of CW when switching to TX by CW key. When I tested it with my receiver, there was no big problem in transferring without delay (TX -> CW Interval). But I implemention a TX->CW interval feature for personal choice. This may be useful when using external amp. was worried a lot because EEProm has a limited number of writes. Maybe the author has saved it only when VFOA and VFOB are converted. It was implemented by storing it only once when the frequency stays 10 seconds or more after the change. The global variable used in the program written by the author has a capacity of 67%. Above 70% ~ 75%, Arduino IDE started to alert you. I reduced this to less than 40% and continued the next task. You can manage the memory of uBITX from the outside, and you can backup and restore the memory. 13. modified the default usb carrier value used when the setting is wrong. 14.Fixed a routine to repair when the CAT protocol was interrupted before program distribution. Excellent, thanks for sharing your skills and innovation. I am looking forward to trying out your arduino code and software. Does your current software support the lcd touch display? I saw your demo and thought it would be a great addon as well. Source code released today. If you fork my source on github you can always see the latest version. I tried to release it after the beta version, but there were a lot of people asking for it. So the code will change from time to time. And uBITX is difficult to program because it does not have touch screen, but it can be easily implemented by connecting Raspberry pi. Now I'm preparing to do something interesting in raspberry pi. Hi Thanks for new CEC version of code, but I have slight problem. Mine is homebrew ubitx and it uses 27MHz crystal with SI5351, so I am not getting any output after uploading new hex file. For my homebrew ubitx I also need to disable " cwKeyer(); " in main loop as it causes issue with my setup. Can you please help me with these two issues?. Do you have any plans to share your source code. Thank you for your all efforts. Sure! i am ready at any time to help you! Using 27Mhz, the VCO frequency seems to have changed a lot. If you do the test, I will modify some of the code and register the firmware file. or you can modify it yourself. The source code was scheduled to be released next week after the Beta version was released, but it was released today.So the code is likely to change from time to time. What I want is a modified source for 27Mhz that will be open to people like you who use 27Mhz. If you fork my project from github you will always see the fixes and I will accept it anytime you do pullrequest. Thank you very much sir. I will try to modify source file to suite my homebrew ubitx project. If required I will trouble you again, I hope you don't mind. I will cooperate whenever I can. Just when I finish my vacation and go back to research or project, I may not be able to answer immediately. 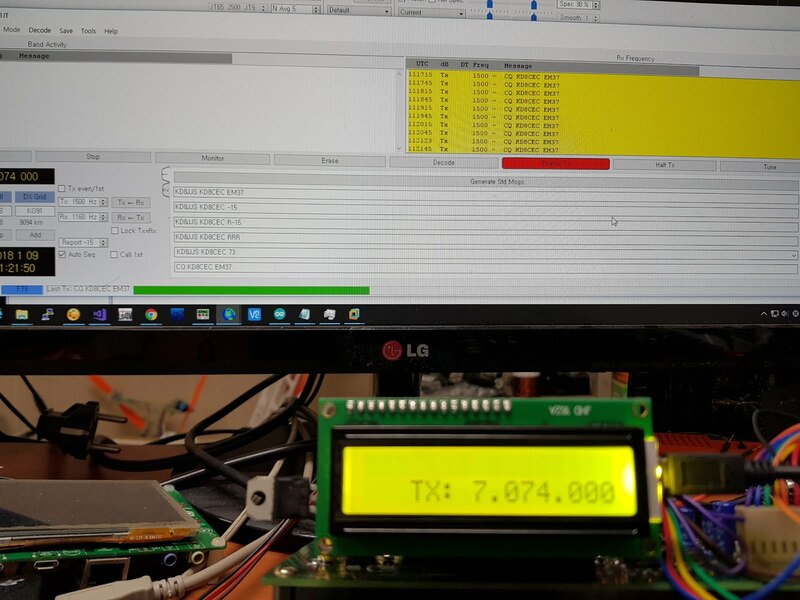 Hello, Thank you for you work :), i have a question- its same version of code that this version of 4x20 lcd ? https://github.com/vk3dan/ubitx-20x4 ? this version also support cat, but i really want your cat version :) ? Maybe this your version with your cat but only modifited to 4x20 lcd ? Could you tell me :) thank you ! I am sorry that the reply is too late. Comments on blogs are difficult to check quickly. The vk3dan code is also very good! If you want other things, please wait a moment. The concept so far has been a concept without hardware modification. Now a small unit of hardware modification will be done together. Hi Ian. I'm using a different Raduino, and wondering if the .27 calibration mode is similar to the original ? I can not tell you exactly because I do not know other Raduno. However, the calibration of my firmware is the same as the original source for uBITX. I am the only unmodified part. Is it possible to use the CAT interface without USB? Just with a separate 3-Pin serial connection RX/TX/GND ? (D0,D1 and GND).